Movie Treasures By Brenda: Got Zombie Mugs? In the spirit of the rapidly approaching Halloween celebrations, I would like to share with you this lovely (or should I say horrible) Zombie mug. This handsome black mug will hold 15 ounces of your favorite steaming hot...coffee. As the individual who has it for sale says, you need to own this mug so that your friends and families know where you stand on the subject of Zombies and so that they will know that they can turn to you when the Zombie Apocalypse comes. 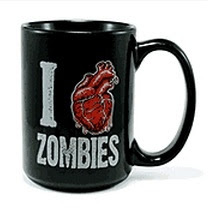 To buy this mug or to see a collection of Zombie coffee mugs that includes horror-filled, fun and funny mugs, visit five zombie mugs.